Eat This (In Worship), Not That! 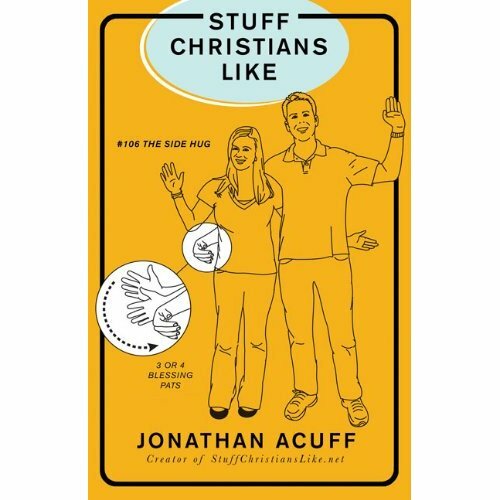 Last weekend Evan and I visited the former home church of preacher’s kid and author John Acuff who is known for his blog and book Stuff Christians Like, a satirical yet sympathetic review of odd church practices. I visited the church to critique the windows (the good stuff) and walls (and not so good stuff) I found in worship. I celebrated the church’s treatment of visitors, its huge painted murals in the education wing, and a quality praise band. I criticized placement of a five minute Finance commercial at the start of worship, the preacher’s assessment that 98% of New England is unchristian, and a lack of energy in worship. Feel free to read the whole REVIEW HERE. #3. Reading “love is patient” at your wedding. #4. Books with people on the cover. #6. Songs with bottomless lyrics. #8. Singing friends are friends forever at camp. #9. Comparing Braveheart to Christianity. #12. Getting awesome in a certain number of steps. #13. Adding gyms to your church. #14. Dating God instead of me. #16. Greeting the people around you. #19. Dressing up church with cool words. #22. Mixing sign language and music. #24. Church names that sound like clothing stores. #25. Jonah, Noah and David. #26. Songs that sound Christian but aren’t. #30. The end of the Harry Potter series. #32. Lasers instead of stained glass. #33. Singing with our hands raised. #34. Subtly finding out if you drink beer too. #36. Creating new types of services. #39. Giving expert advice on things we’ve never experienced. #41. Making music that is impossible to exercise to. #42. Putting God on your business card. #44. Saying God is not funny. #45. Getting the money’s worth out of youth group liability forms. #46. Super, happy shiny Christian radio. #47. Rooting for secret Christians on American Idol. #53. Saying “I’ll pray for you” and then not. #55. Getting a precise defintion of “virgin” from your youth minister. #56. Talking to strangers on airplanes. #57. Not owning nice stuff. #60. Youth Sunday – A parade of mediocrity. #62. Being slightly less nice than Mormons. #63. Rededicating your life. Again. #64. Fearing the rapture would come before you lost your virginity. #65. Ending emails with God shout outs. #66. Eating your body weight in goldfish in Sunday School. #69. Saving seats at church. I laughed out loud at #96. Using God’s Favorite Word in Prayer. The word is “just.” As in “Lord, we just praise your name and we just lift you up today Lord…” God’s second favorite word must be “Father” given the frequency of its use at Grace last Sunday. I also liked #256 The Unicorn Hymn. Worshipers hear a melody that sounds a lot like an oldie-but-goodie hymn like “Amazing Grace,” a mystical, unicorn like thing that few experience in contemporary worship churches like Grace. But there it is! The classic hymn! But wait, will they transform it into some other hipster hymn? Will they deconstruct it into a chant? Sure enough, “Amazing Grace” morphs into something contemporary about being “set free.” Yep, it is easy to ridicule contemporary churches. I have an idea of stuff Christians like, but these church services make me less sure of what God actually likes.